Milltown got the better of Moycullen in group four of this year's Galway Senior Football Championship to advance to the quarter-finals, winning on a score line of 3-13 to 1-9. After two high scoring wins in their first two games, Moycullen will be disappointed with their disjointed performance, which leaves them facing Monivea, both both needing a win to progress through the group. After their defeat to St Michael's (2-13 to 1-8 ), Caltra are rooted to the bottom and face a huge struggle to avoid relegation after four disappointing results. St Michael's face a relegation play-off even if they beat a flying Milltown, due to their losses to Monivea-Abbey and Moycullen. All that is left to be decided in this group is to see whether Monivea-Abbey or Moycullen go through with Milltown to the county quarter finals, in what is sure to be a huge battle between two teams who feel like they should be still standing towards the latter end of the 2018 championship. Group one: Cortoon Shamrocks lost to Claregalway by 1-15 to 1-13, and the Shamrocks are definitely in a relegation play-off now, where they will be joined by either Claregalway or An Ceathru Rua. St James have performed well thus far in the championship under the guidance of Gay O’Brien, and they are through to the county quarter-finals alongside Corofin following their five-point win over An Ceathru Rua last weekend in Pearse Stadium. In a high scoring game (2-18 to 2-13 ), the city men came out on top and that victory sees them play Corofin on the weekend after next to see who tops the group. Missing county star Paul Conroy, who is a long term injury, Johnny Duane, who has an injured knee, Josh McFarlane, Owen Teagle and Fintan Cooney ( shoulder ), they performed admirably in what was a play-off against An Ceathru Rua to see who advanced. Eoin Concannon stepped up to the plate with so many of his teammates missing, and he hit a massive total of 1-10 with 1-8 of that coming from play. Playing with a weakened side and performing so well, they are deservedly through the group stages. Group 2: Group two has Bearna and Tuam in relegation due to Tuam’s head-to-head record against the top three, after their disappointing loss to Killannin (1-16 to 3-7 ). 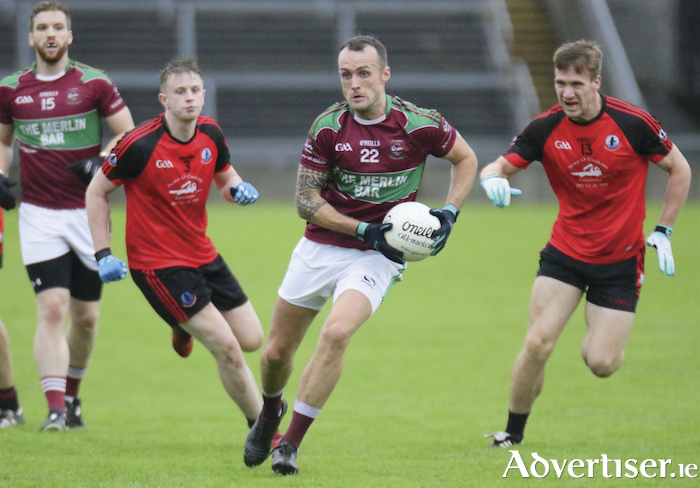 After Salthill’s convincing 11-point win over Bearna (2-13 to 0-8 ), any team from Salthill Knocknacarra, Annaghdown and Killannin are still able to get through depending on the final round of games which see Annaghdown play Bearna and Salthill face Tuam. Group 3: In this group Michael Donnellan's Mountbellew are through to the last eight with three wins from three outings, and either this year’s surprise package of Killererin or Caherlistrane should follow them through. Killererin had a great win over Kilconly by 2-12 to 1-9. However, their two draws mean if Caherlistrane beat Kilconly in their final game, they will go through as group runners-up. A defeat to Caherlistrane will also put Kilconly in relegation where they look set to be joined by Naomh Anna Leitír Mor who, after their 1-13 to 2-7 loss to Caherlistrane at the weekend, have only one point from their three games.